More Socorro hotness that’s hot off the press! Another hotness is this : Java crash signatures w/ address location should be pooled together as one crash signature… bug 726385 – replace 8 digit hex addresses with a placeholder within Java signatures. It’s helpful to have it all in one signature. It seems we need a little more work to combine some more signatures that are related and split apart the signatures that aren’t related; We are definitely getting there. That’s right! Beta 2 is the bottom line for crashes per 100 ADU. And we’re hoping that beta 3 will be even better! So kudos to the Socorro team, though it may not be exactly perfect, it’s one of the best tools out there to help fight crashiness! Without Socorro’s presence it would be hard to determine what crashes are most important. 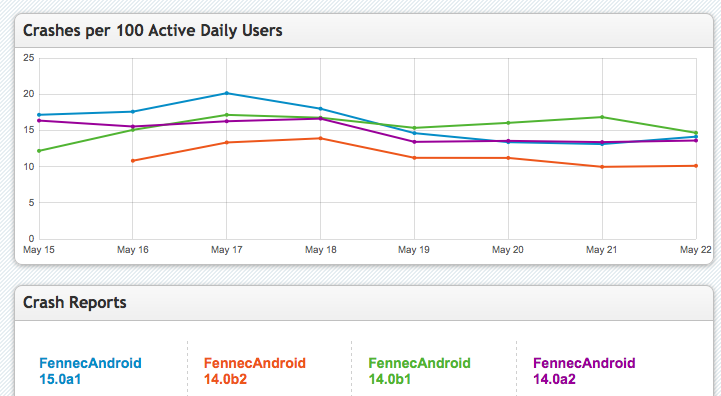 With more people using fennec on a daily basis (Active Daily Users), and hitting crashes; we can see the sheer volume of crashes. This helps raise the priority of which crashes should get the most attention first, and which ones we might be able to put off until we have the resources to fix it. So please! Make sure you update fennec version (whether it be nightly, aurora, beta, or release) to the latest and use it every day!